As fans are eagerly anticipating the feature film adaptation of Suzanne Collins’ The Hunger Games, Lionsgate is doing their best to tide them over. A new poster was recently unveiled as part of a “100 Days Until The Hunger Games” celebration, and now the studio is set to release a collection of China Glaze nail polish in conjunction with the film. 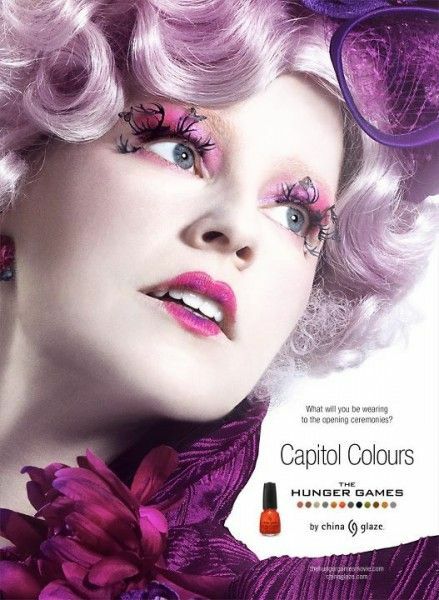 The “Colors from the Capitol” collection was actually announced a couple weeks ago, but today an ad for the nail polish has been released and it features a new look at Elizabeth Banks as the flamboyantly pink Effie Trinket. While the collection won’t be released until March 1st, hopefully this is the first of many movie tie-in ads that’ll give us new looks at some of the characters. Hit the jump to check out the image. The Hunger Games opens March 23rd.